What Kind of Mouthwash Should You Use? This might sound obvious, but the best mouthwash for you depends on your specific needs. Most people could benefit from using mouthwash each day, but everyone’s dental health is different. Cavities – For cavity prevention, a fluoride (also called anti-cavity) mouthwash is very helpful. Fluoride is a mineral that strengthens your teeth, much like calcium strengthens your bones. Although fluoride is in most toothpaste, it gets rinsed away immediately, so it’s helpful to get an extra “coating.” Just be sure not to rinse with water after using a fluoride mouthwash. Bad breath – Nearly any mouthwash will have flavoring that temporarily improves bad breath. But some products are only designed to freshen the breath and don’t have the “burn” of alcohol, which can be great when you simply want something minty and mild. However, if you have chronic or persistent bad breath, you may need a mouthwash designed to kill bacteria and treat inflamed gums (see below). Bleeding, swollen, or tender gums – These are all signs of inflamed gums (also called gingivitis), which is important to address before it progresses to later stages of gum disease. You’ll want a mouthwash that kills bacteria, so look for a product that says “antiseptic,” “anti-bacterial,” or that it treats gingivitis on the label. Moderate or Severe Gum Disease – Beyond early-stage gingivitis, gum disease can’t be cured. However, it can be managed to keep it from progressing. 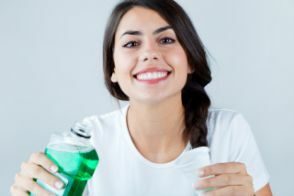 If you have gum disease, a dentist will recommend the best tools and products to use at home and may prescribe a prescription-strength mouthwash (called chlorhexidine) to be used for just 2 weeks at a time. This rinse targets the specific type of bacteria that causes gum disease. Multiple issues – There are also “all-in-one” options that combine multiple benefits in the same formula. Just experiment to find the one that works best for you. What’s the Best Way To Use Mouthwash? It’s important to keep in mind that mouthwash is only a great addition to your oral hygiene routine. It definitely cannot take the place of brushing and flossing, which is far more important for your oral health. With that said, the right mouthwash can help you maximize your efforts at home. And now that you know more about your options, you’ll be able to make the right choice at the store a lot faster! Dr. Robert Long studied dentistry at the University of Health Science Center at San Antonio and has over 25 years of experience as a family dentist. He knows that choosing oral hygiene products can be overwhelming and always recommends the best products for his patients’ individual needs. If you have any questions about your oral hygiene, he can be reached via his website.